Loratadine is a Generic name for second-generation antihistamine drug that is used to treat allergies. This drug is efficient in treating the symptoms of indoor and outdoor allergies. This drug reduces the effects of body chemical histamine in the body. Loratadine is used to treat runny nose, sneezing, watery eyes, skin rash, hives, itching, and other cold or allergy symptoms. However, loratadine can’t prevent hives or other allergic skin reactions. Loratadine is available in the form of oral syrup, solution, capsule and tablets. It is also available in a combination with decongestant called pseudoephedrine. Loratadine was approved by FDA in 1993 and was originally manufactured by Bayer Healthcare. It is on the WHO’s List of Essential Medicines, one of the most effective and safe drug needed in a health system. In the U.S. it is also available as OTC product. Loratadine belongs to the class of organic compounds known as benzocycloheptapyridines. 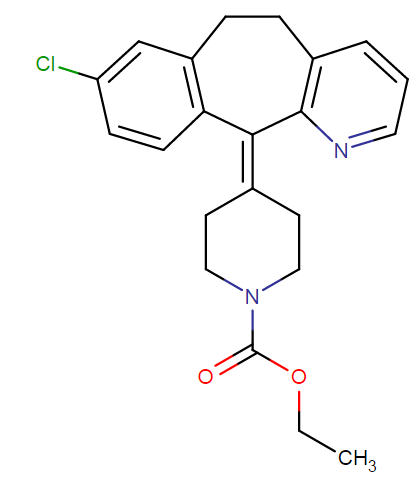 It us an aromatic compound containing benzene and a pyridine ring bonded to a seven membered carbocycle. In what dosage forms is Loratadine available on the market? Loratadine is available in following forms and doses: tablets 10 mg, chewable tablets 5 mg, orally disintegrating tablets of 5 and 10 mg, capsules 10 mg, oral solution 5mg/5ml and syrup 1mg. What are different Brand names for Loratadine? What are FDA approved indications for Loratadine? How Loratadine works in the body? Loratadine belong to the group of long acting second generation antihistamine drugs, structurally similar to cyproheptadine and azatadine. Loratadine actions are similar to other antihistamines, but in comparison with other H1-blockers, loratadine is shown to have more competitive, specific, and selective antagonism of H1 receptors. The true mechanism of this interaction is unknown, but it has been suggested that loratadine’s prolonged antagonism at histamine receptors may be because of loratadine’s slow dissociation from receptors binding sites or because of the formation of its active metabolite, desloratadine. Loratadine, doesn’t penetrate effectively to CNS and has a low affinity for CNS H1-receptors, thus causing less sedation. Loratadine and free body histamine are in competition for H1 receptor places in the body. Loratadine exhibits specific and selective peripheral H1 antagonistic activity. By blocking the action of endogenous histamine, loratadine relieves negative symptoms caused by histamine such as nasal congestion and watery eyes. Loratadine has low affinity for cholinergic receptors and does not have any considerable alpha-adrenergic blocking activity in-vitro. 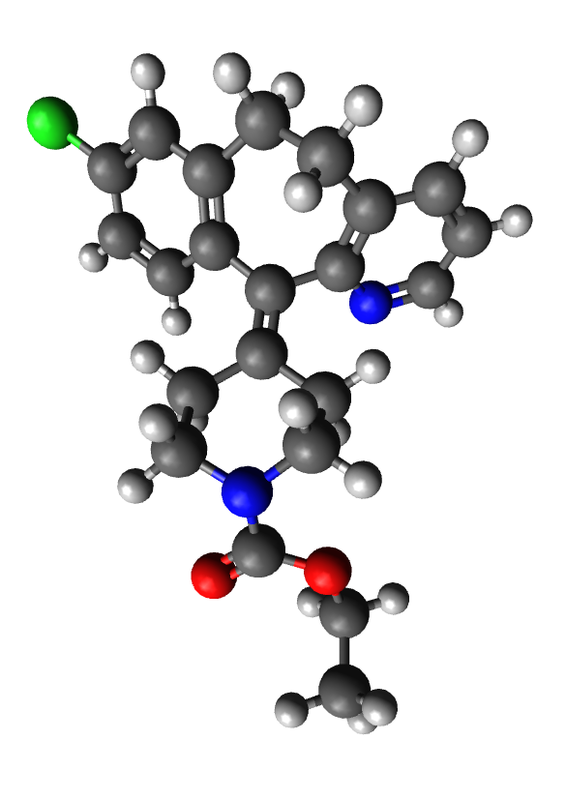 Loratadine also inhibits the release of histamine and leukotrienes from mast cellsof animals, and the release of leukotrienes from human lung fragments, although the clinical importance of this is still unknown. Loratadine causes headache in about 12% of treated patients. Loratadine doesn’t pass in CNS effectively, thus it doesn’t cause important sedation, drowsiness or impair psychomotor skills like other antihistamines. One study showed that second generation antihistamine drug cetirizine was 3.5 times more likely to cause sedation than loratadine. Studies also showed that there was no important difference in causing sedation between loratadine and fexofenadine. Loratadine in if take in high doses for a long-term can cause side effects such as: hypertension, palpitation, supraventricular tachyarrhythmias, hypotension, syncope and tachycardia. In one study loratadine in 20 mg was administered with nefazofone 300 mg twice a day. This combination causes prolongation of the QT interval as a side effect. Loratadine may cause nausea and dry mouth as side effects. Hepatic side effects after loratadine use may include: rare reports of jaundice, hepatic necrosis and hepatitis. Two cases of liver inflammatory necrosis have been described after loratadine use. One case exhibits this serious side effect after 2 weeks of starting therapy while the other case occurred 14 months after the beginingt of therapy. Liver transplantation was necessary in one patient. In some rare cases loratadine may cause fixed drug eruption. Children 2–5 years of age with hepatic failure: 5 mg every other day as oral solution. Adults and children older than 6 years of age with hepatic failure: 10 mg every other day as tablet, orally disintegrating tablets or oral solution. Fixed-combination of loratadine/pseudoephedrine shouldn’t be used in patients with hepatic impairment. Adults and children ≥6 years of age with renal insufficiency (GF rate <30 mL/minute): 10 mg every other day as tablet or orally disintegrating tablets or oral solution. Patients who overdosed loratadine and took more than 10 mg a day are at greater risk of severe sleepiness, headaches and irregular heartbeat. Children who overdosed the recommended 10 mg of loratadine may have movement problem and behave similarly to patients with Parkinson’s disease. They may also get racing heartbeat. Loratadine is known as non-sedating and non-drowsy antihistamine drug. This second-generation antihistamine drug has a very low ability of penetration into CNS. Studies also found that loratadine has low affinity for H1 receptors in the brain. However, case reports showed that almost 7% of patients will experience drowsiness during loratadine use. Are there some precautions and warnings during Loratadine use? Patients should tell their doctor or pharmacist if they are allergic to loratadine or any other medicines, or any of the inactive ingredients that can be found in loratadine formulations. Always check the label for a list of the ingredients. Patients should tell their doctor and pharmacist what prescription and nonprescription medications, nutritional supplements, vitamins and herbal products they are using or plan to take. Always mention medications for colds and allergies. Women should tell doctor if they are pregnant, plan to become pregnant, or are breast-feeding. If you become pregnant while taking loratadine, call your doctor. Patients who have phenylketonuria should know that some loratadine products such as orally disintegrating tablets may contain aspartame that forms phenylalanine. Elderly patients may have increased risk for comorbidities associated with anticholinergic effects of the drug. Patients who have hives should tell their doctor right away if they have experience any other symptoms because they may be the signs of a more serious condition. Such examples are hives that are an unusual color, hives that do not itch or hives that look bruised or blistered. Can I take Loratadine while pregnant? Loratadine should not be used during pregnancy. Loartadine is categorized in the pregnancy Category B list of drugs by the FDA classification because studies have been showed that the drug didn’t cause any serious problems when given to pregnant animals, even at very high doses. A few studies conducted on humans have proposed that loratadine does not increase the risk to the fetus, such as birth defects or miscarriages, although more thorough studies are necessary. While studies on humans did not find any health issues with loratadine use, these studies could not completely rule out the possibility of risk during pregnancy. Thus, loratadine should can be given to a pregnant woman only if her doctor is ceratin that the benefits to the woman outweigh any possible risks to the unborn child. Health professionals from The American College of Obstetricians and Gynecologists (ACOG) and The American College of Allergy, Asthma and Immunology (ACAAI) recommend using other antihistamines such as chlorpheniramine and tripelennamine which showed to be relatively safer during pregnancy. Rather, lortatdine may be considered for use after the first trimester and only as the last option. Can Loratadine be used during breastfeeding? Small amounts of loratadine can be excreted into human milk. American Academy of Pediatrics classifies loratadine as a drug that is usually compatible during breastfeeding; however breastfeeding women should consult their doctors before taking this drug. Studies have been shown that loratadine its active metabolites such as desloratadin can pass into the human milk. The maximum concentration of loratadine in milk occurs after 2 hours of taking the drug. But the amount of the drug in the breast milk is probably too low to cause any health issues on the infant. Many medical experts consider loratadine to be safe during breastfeeding. Before taking loratadine, as well as any other drug, breastfeeding women are always advised to consult their healthcare provider. Can I take Loratadine (Claritin) with Alcohol? It is never advisable to take any drug with alcohol, thus it also applies for loratadine. Combination of loratadine and alcohol may or may not cause problems. Usually, patients who experience drowsiness during loratadine use seems to be more vulnerable to these drugs side effects, thus they are at increased risk of experiencing side effects due to such drug interaction; so they are are advised to avoid drinking alcohol. Alcohol is a CNS depressant that can make you drowsy, sedated, lightheaded and sleepy, similarly to the effects of most antihistamines such as loratadine. No matter, loratadine is considered as “non-drowsy” drug, clinical studies revelead that up to 8 % of patients taking this drug described drowsiness. In such patients, alcohol can potentiate the undesired effects of loratadine and drowsiness is the most common one. Loratadine is rapidly absorbed after oral administration of 10 mg tablets. Loratadine’s maximum effect is expected after one to two hours. How long does Loratadin stay in your system? Loratadines elimination half-life is about 8 hours with its metabolite desloratadine’s half-life of about 27 hours accounting for its long-lasting effect. Can you give loratadine to dogs and cats? Loratadine can be used to treat dogs or cats suffering from skin irritation caused by allergies. It can be also use to minimize side effects from vaccinations and relieve the inflammation related to mast cell tumors. Owners should give their pets either the plain formula or children’s formula. 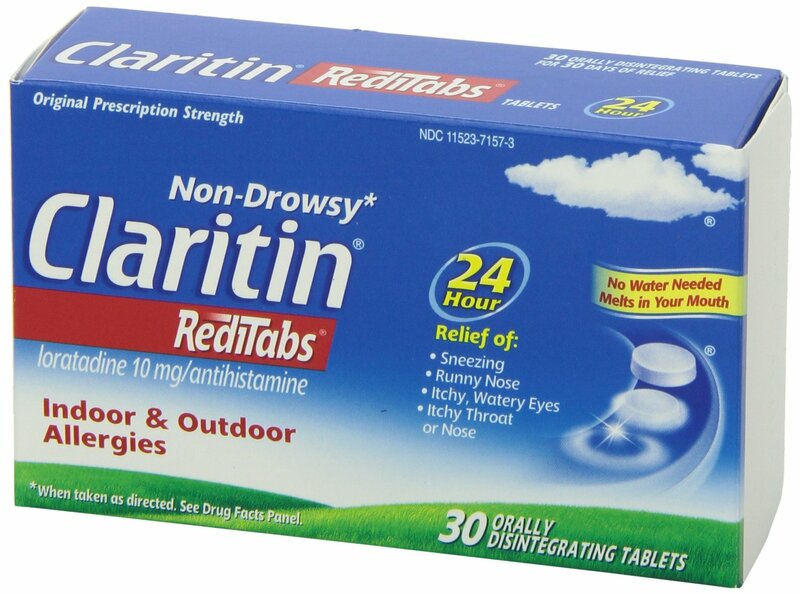 They should avoid using Claritin-D, because this formulation contains pseudoephedrine. 240 mg of pseudoephedrine could be lethal to lower weight pets and could cause undesirable stimulant-side effects in larger dogs. Loratadine can be given to the pet for relieving allergy symptoms at a dosage of 0.12 mg/lb to 0.22 mg/lb (0.25 to 0.5 mg/kg). What is the price of different Loratadine products? This loratadine price guide is based on using the Drugs.com discount card which is accepted at most U.S. pharmacies. Prices are for cash paying customers only and are not valid with insurance plans. Loratadine is available in the form of syrup or liquid, an immediate acting or extended release tablet, and a rapidly disintegrating tablet to take by mouth. It is usually taken once per day with or without food. Patients should follow the directions on the package label carefully, and ask their doctor or pharmacist to explain any part they do not understand. Always take loratadine exactly as directed. Do not take less or more than directed on the package label or recommended by your doctor. If you take more loratadine than directed, you may experience side effects such as drowsiness. If you are taking the rapidly disintegrating tablet, follow directions to remove the tablet from the blister package properly without breaking the tablet. Do not try to push the tablet through the foil. After you remove the tablet from the blister package, immediately place it on your tongue and close your mouth. The tablet will quickly dissolve and can be swallowed with or without water. Do not use loratadine to treat hives that are blistered or bruised, that have unusual color, or that do not itch. Call your healthcare provider if you have this type of hives. Stop taking loratadine and call your doctor if your hives or allergy symptoms do not improve during the first 3 days of your treatment or if your hives last longer than 6 weeks. Call your doctor if you do not know the cause of your hives. If you are taking loratadine to treat hives and you develop any of the following symptoms: difficulty swallowing, breathing or speaking, swelling in and around the mouth or swelling of the tongue; drooling; dizziness; wheezing; or loss of consciousness get emergency medical help immediately. These may be symptoms of a life-threatening allergic reaction called anaphylaxis. If your doctor suspects that you may experience anaphylaxis with your hives, he may prescribe an epinephrine injector (EpiPen). Do not use loratadine in place of the epinephrine injector. Should I take loratadine with food? Loratadine will be absorbed faster if it is taken on an empty stomach. However, loratadine may be also taken with food and the overall effect won’t be changed. Patients, who have problems with gastrointestinal issues after taking loratadine, should take this drug with food. Can I take loratadine and cimetidine (Tagamet) together? Loratadine should not be taken with cimetidine together. Cimetidine interferes with the metabolism of loratadine. Taking cimetidine together with loratadine may increase the serum concentrations of loratadine in the body. Although studies suggest that such increase is insignificant and is not likely to cause adverse effects, it is best to consult healthcare provider, especially if there is an increase in side effects. Can I take Loratadine and Erythromycin (Ery Tab) together? Loratadine and erythromycin shouldn’t be taken together. This macrolide antibiotic can alter the metabolism of loratadine in the body, possibly increasing levels of loratadine in the blood. However, studies suggest that such increase is insignificant and is not likely to cause unpleasant side effects for most patients. Can I take Loratadine and Nizoral together? Taking loratadine and ketoconazole which is the active ingredient of Nizoral together can possibly increase loratadine levels in the blood, thus increasing the chance of loratadine’s side effects. Can I take loratadine if I have liver or renal disease? Loratadine is predominantly metabolized by the liver into an active metabolite, and both parent drug and metabolite are excreted by kidneys. Patients with liver and/or renal disease may be at higherr risk of side effects from loratadine due to drug and metabolite accumulation in the body. The general recommendation is one-half of the regular doses in patients with liver failure or reduced renal function (GFR < 30 mL/min). Patients with liver problems should not use fixed combination products of loratadine and pseudoephedrine. Can loratadine get you high? When used in recommendable doses of 10 mg loratadine won’t show any CNS side effects. However if it is used in larger doses, loratadine may cause CNS side effects such as drowsiness and sedation. Loratadine however does not cause euphoria and is not known classified as abusive substance. Can Loratadine be taken by patients with high blood pressure? In recommendable doses loratadine should not cause cardiovascular side effects such as high blood pressure. However decongestants like pseudoephedrine that can be found in some fixed combination products with loratadine (Claritin D and Alavert D) may be responsible for that. Patients with cardiovascular problems and hypertension should avoid products that contain loratadine in combination with pseudoephedrine. Loratadine and grapefruit juice are both metabolized in the liver the same way, so there’s a small chance of adverse effects when both are taken at the same time. Always talk with your doctor or pharmacist about drinking grapefruit juice if you are taking loratadine. Can you take Claritin and Benadryl at the same time? Patients should not take Claritin and Benadryl together without doctor advice. They are both antihistamines drugs and work similarly in the body, so if they are taken together their effects will become additive and patients may duplicate the active drug of each medication increasing the chance of side effects to happen.